He appears like a ghost, standing ramrod-straight in his white dress shirt, lurking silently in the daylight. “You’ve lost weight,” says Toshio (Kanji Furutachi), the family man who greets him at the entrance to the garage. “Everyone loses weight in there,” goes the reply, and we understand instantly, before we’ve even gotten to know either of these men, what has kept them apart for years. The face from the past belongs to Yasaka (Tadanobu Asano, from Ichi The Killer and the Thor movies), here to make up for lost time after a small eternity rotting behind bars. Within minutes, Toshio has offered his estranged friend a job within the workshop he runs from the garage. And within hours, he’s invited Yasaka to move into his small, dimly lit home—a decision that perplexes and agitates Toshio’s wife, Akié (Mariko Tsutsui), who hasn’t heard one story about the calm, polite ex-convict now sleeping down the hall from their bedroom, as well as the bedroom of their young daughter, Hotaru (Momone Shinokawa). What crime landed Yasaka in the clink? And why does Toshio so readily open his business and home to the man? The questions hang like ominous storm clouds over the placid opening stretch of this heavy Japanese drama, which reiterates a common, cynical lesson from the noir bible: When the past comes knocking, trouble comes with it. 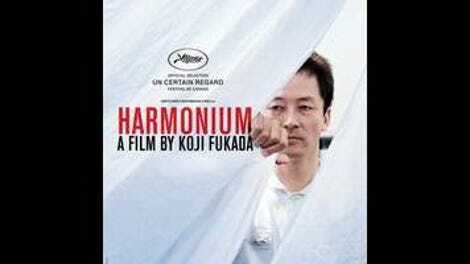 The first film by writer-director Kôji Fukada (Hospitalité) to open theatrically in America, one year after it won a major prize at Cannes, Harmonium lurches toward a crucible of consequence, like a roller-coaster slowly climbing and climbing before the sharp plummet at the top. Yet beyond the suffocating inevitability, the film is also unpredictable, both in the fatalistic progression of its story (let’s just say that there’s a rather dramatic leap in time) and in the behavior of the characters driving it. When someone casually threatens to kill someone else late in the movie, the gut-churning charge of the moment is that we have no real idea if they mean it. The style can be unpredictable, too. 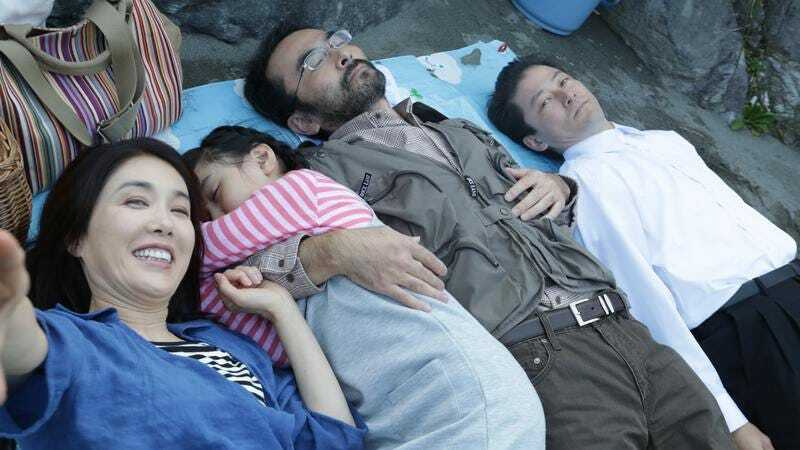 The easiest point of reference is probably countryman and fellow merchant of dread Kiyoshi Kurosawa—specifically, his 2008 masterpiece Tokyo Sonata, which also concerned a buckling marriage, a non-communicative husband, and a musically gifted child. (The title comes from Hotaru’s instrument of choice, pumping off-kilter melody through the family’s boxy, suddenly crowded house.) Like Kurosawa, Fukada uses static camerawork and pregnantly protracted takes to ratchet up the unease. But he also knows when to jarringly break the controlled, medium-shot languor—predatorily tracking young Hotaru as she glides down the street on Heelys, or pulling into a sparingly employed close-up to absorb some emotional duress. Harmonium creeps along at a pace some may find too deliberate. But no more than a few minutes ever pass without some striking and symbolically loaded image, like the shot that places husband and wife on opposite sides of the 1.66:1 frame, quietly arguing about their new lodger/employee, who we can see working in the background through a small window above their heads. The less said about where the story goes, the better. The themes, however, are familiar enough to be called archetypal. Will it surprise any student of drama to learn that chickens come home to roost? Or that secrets can eat away at domestic bliss? There are moments, like a late spat between Toshio and Akié, where Harmonium gets more on the nose than it should, letting the characters say what’s already painfully clear from their predicament. But the actors navigate their uncertain motivations with finesse—especially Asano, who captures not just the shell-shocked daze of someone trying to readjust to life on the outside but also a carefully, unnervingly suppressed wellspring of resentment. By its unforgiving conclusion, Harmonium has plunged headlong into tragedy, but not quite in the way you might imagine. It keeps the guessing games going—even for those who know, from that first awkward reunion in the garage, that things can’t end well for anyone involved.